Saturday, April 27, 2019 REGISTER NOW! You can expect a hands-on day of outdoor fun in nature! Presenters share insights and activities based on their work in nature preschools, forest kindergartens, or other nature-based programs. Training is ideal for educators working with children ages 3-6 years old. Light breakfast and lunch are included on Saturday, but bring your canteen for drinks. In addition to interactive workshops, our hosts at the Wildrock offer an informal tour of their center and grounds over lunch. This training is pending VA and DC training approval for clock hours. ERAFANS will provide a professional development certificate at the conclusion of the event. Please dress for the weather, as at least 50% of this event will take place outdoors, and don't forget your canteen! Higlights include sessions from Wildrock, Blue Ridge Forest School, Living Earth, and Blue Mountain School. From primitive skills, and core routines to native plant ID, composting in a jar and an Outdoor Gear Petting Zoo, this retreat is packed with topics you will love! Survival Skills, Core Routines, and Nature Connection | 9:15-11:15 a.m.
How can we help children grow to be adults who protect and steward the environment? We believe it is by fostering not just knowledge of nature, but relationship with nature. Discover survival skills and routines that help expand awareness for kids and adults during this hands-on session. These skills and routines grow genuine connections and an authentic love of the natural world. Tapping into the Magic of the Forest | 9:15-11:15 a.m.
Wonder, exploration, discovery are the words describing my experiences in the forest. Join me on a short journey through the woods to rediscover the child within. Participants will acquire tools to inspire and create a safe container for students to awaken their connection to the forest and see the beauty beyond the trees. Ecotherapy Indoors | 9:15-10:15 a.m. This workshop explores the use of natural materials indoors to promote resiliency skills. Participants will learn three strategies for supporting children in using foraged natural materials to develop internal resources for self-soothing. Experiential stations will be made available for participants to practice the activities. Strategies are based on children’s innate capacity to use their imagination to address emotional needs. Preschool Traveling Roadshow! | 10:15-11:15 a.m. | 11:25-12:25 p.m. This interactive workshop will get your creative juices flowing as we discuss the merits and challenges of utilizing public land for a forest preschool. Is it possible to have a mobile forest preschool? You bet! Join us during this workshop to find out how! Mason Jar Composting | 11:25 - 12:25 p.m. This is a hands on introduction to composting. You will create a Mason Jar Composting environment to take home, which will evolve in into rich, usable soil. This is a classroom project that stimulates the senses, allowing children to be fully engaged in their learning experience. Helping Families Connect to the Outdoors | 11:25-12:25 p.m. In a technology saturated world it can be challenging for families to make time for the outdoors. We will be sharing strategies to help families engage with the natural world and maintain the connection their children make when attending Forest Kindergartens and Nature Schools. Informal tours of Wildrock and an Outdoor Gear Petting Zoo also over lunch! Outdoor Gear Petting Zoo | 12:30-1:30 p.m.
"A balaclava-what?" With the proper gear children are free to use their energy for play, growth, and exploration. 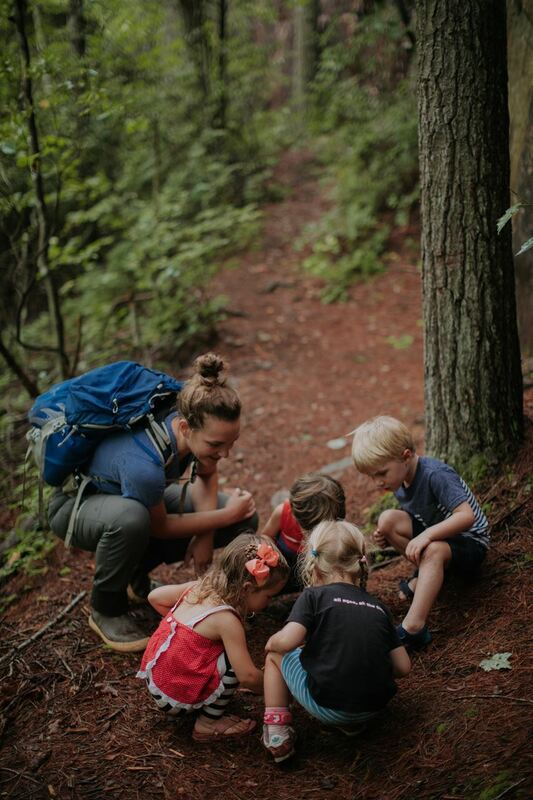 Join Jessica Kiley of Blue Ridge Forest School at the "Gear Petting Zoo" to learn time-tested tips and tricks to keep students warm, dry, free of ticks, and protected from the elements--all while preserving their freedom of movement and ability to climb. "There's no such thing as bad weather, just bad clothing!" Sensory Deprivation & the Nature Cure | 1:30-2:30 p.m.
How children thrive in complex, growing environments and why rooting the foundations of their lives in Nature can foster a lifetime of joy, balance, passion, and purpose. Educator and Founder of Nature Club Kids, LLC, Ann Marie Douglass, has been researching the effects of screens on human development since her own children received their school-issued iPads. She will explain the unintended consequences of today's heavy reliance on screens in our lives and how they can be mitigated by time spent with each other and the natural world. Walk away with actionable steps and hope for a nature-rich future! Seasonal Song & Story | 1:30-2:30 p.m.
Forest School Rhythms and Routines | 2:30-4 p.m.
What does a 100% outdoor forest school rhythm look like from day to day, season to season? 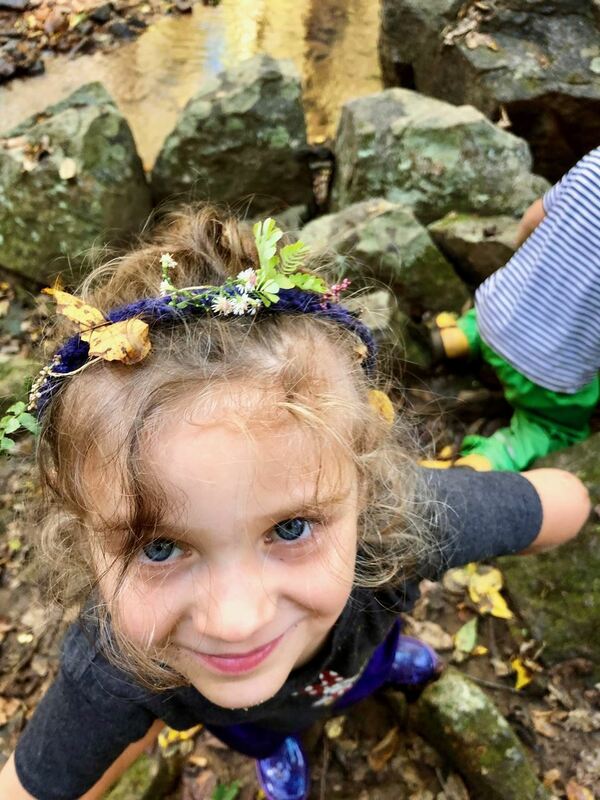 Over the past 5 years, Blue Ridge Forest School’s teachers have been developing and fine-tuning a comprehensive daily and seasonal rhythm that they are thrilled to share with educators who aim to bring any part of their early childhood program outdoors. They will share their time-tested daily flow, specific outdoor circle and story time techniques, tips for eating outdoors, how to encourage authentic child-led imaginative play without a single prop or toy, teacher roles, transition tips, and specific seasonal accommodations. Blue Ridge Forest School’s (BRFS) presenters (Jessica Kiley, Ed.S., past school psychologist and BRFS founder; Lanz Hubbard, Waldorf-trained teacher and BRFS co-teacher) draw inspiration from early childhood best practice teaching methods, forest school best practices, and Waldorf education. BRFS is currently a half-day program for ages 3-6 that takes place at Ivy Creek Natural Area in Charlottesville, Virginia. BRFS is 100% outdoors and in session most months of the year. Conscious Observation | 2:30-4 p.m. Teaching children to be mindful of their surroundings helps guide them to be more conscious of themselves. We will practice being more intimate in our relationship with nature, while discovering how it impacts our relationships with our peers and our environment. We will use our senses for basic plant ID as we draw closer to nature. Panel Discussion: Bridge To Nature | 4-4:45 p.m. Submit your questions throughout the day and hear from our presenters during an informal panel discussion to close the day. Make a weekend out of it! Misty Mountain Camp Resort is nearby, so feel free to bring the kids and camp either Friday or Saturday night. Wildrock has a wonderful nature play space, and there are many great parks and hiking spots near Crozet.